Thousands of bikes are stolen each year, many of which are recovered by the police. 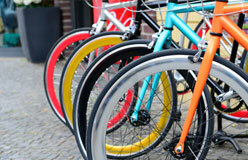 Most bikes cannot be identifed and returned because the serial number and other features are not recorded. Click below to download our Bicycle Identification Card that allows you to record your bike's details. If your bike is stolen, you can then simply give the card to the police.